What are the best foods to eat at the N.C State Fair? There is a Best New Fair Food of 2018 Winner, of course. 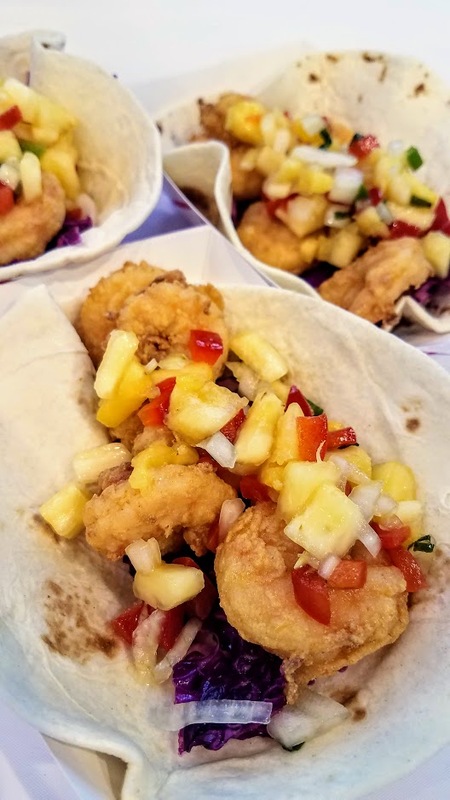 The Cool Runnings Jamaican Jerk pork wrap with mango salsa got the most media votes at the 2018 Media Preview. This yummy dish balanced with the heat of the jerk and the sweetness of the mango will certainly be a crowd favorite. But honestly, there were several dishes that were so good that it was hard to name just one for the media vote. In fact, I didn't. They counted votes before I even got mine in the vendor box. I was too slow to make a final choice because I liked way too many N.C. State Fair Foods this year. 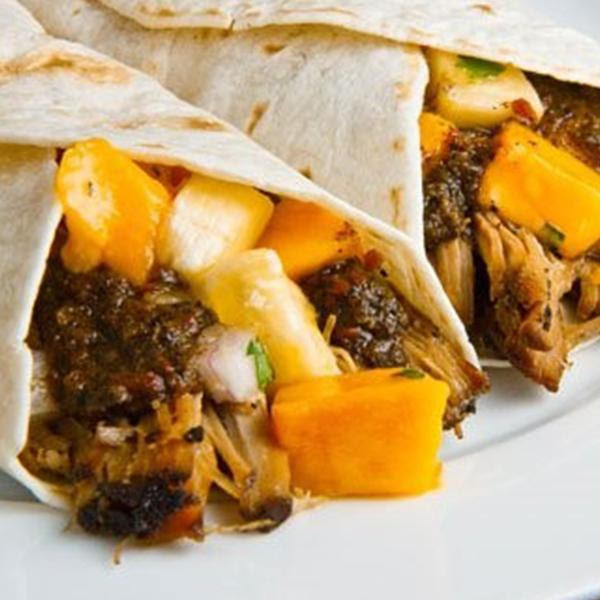 Jerk Pork Wrap with Mango Salsa by Cool Runnings Jamaican. It's spicy, sweet and perhaps a little messy, too. The heat of the jerk chicken balances very well with the sweetness of the mango. So grab some napkins and enjoy. This booth will be located near Dorton Arena. 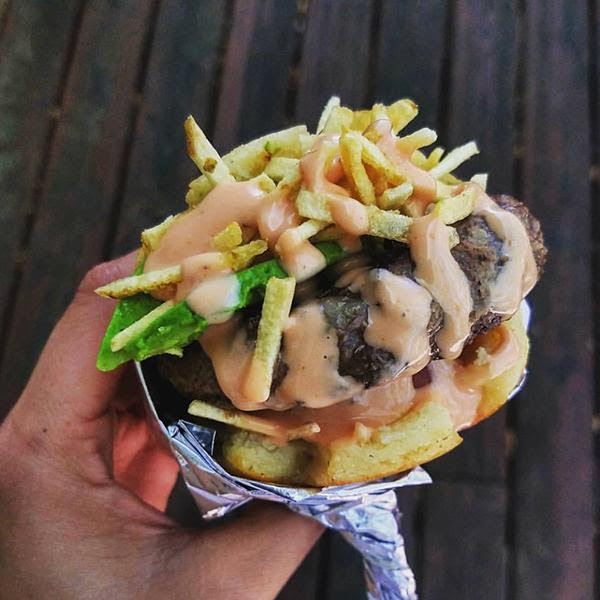 I had to learn to pronounce it (ah-reh-pah), but once the name rolled off my tongue and the taste of the new Arepa burger lingered, this dish became a favorite of mine. And if I had not missed the Media "best fair food" vote due to my slowness, I think my card would have been in this vendor's jar. An arepa is a handcrafted gluten-free white cornmeal bread. This burger is served tomato and onion then topped with matchstick potatoes and traditional pink and cilantro guacamole. You will find these burgers near Kiddie Land. Parents may need the burger to keep their sanity. What's better than fresh North Carolina fried shrimp? Not much. But, put some cabbage slaw and the most delicious pineapple salsa then you've hit culinary fair cuisine. You will be able to find this booth near Dorton Arena. This incredible dish reminded me of the look of a warm Philly cheesesteak. It's the Mediterranean take on a Philly hoagie classic. 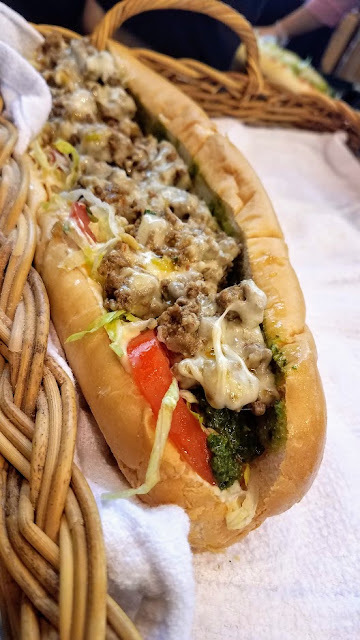 This dish is sauteed lamb with onions, soujouk spices, hummus, Lebanese pickles, melted provolone and mozzarella cheeses, Roma tomatoes plus spicy jalapeno/cilantro sauce on hoagie bread. You can find this food near Kiddie Land. For those who like to keep on walking, this savory dish is for you. 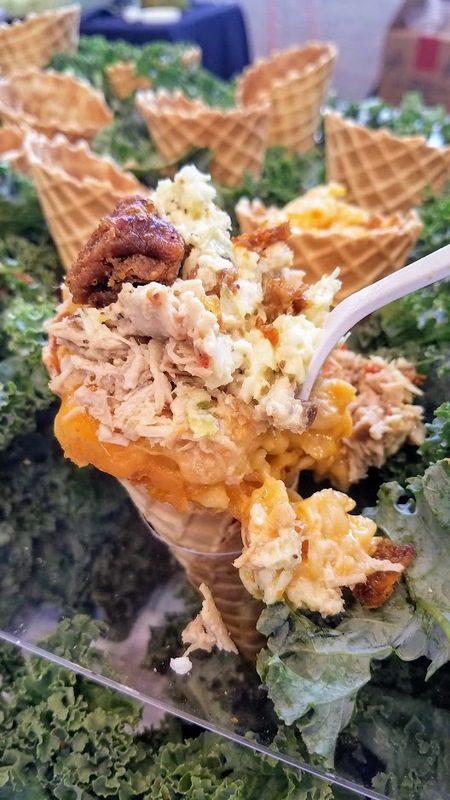 In one cone, you'll find macaroni and cheese, turkey bbq, deep friend turkey cracklings, creamy southern slaw, and special bbq sauce all in one waffle cone. It's a gourmet, southern delight with flavors that impress. You will find this food near the Education building. Deep fried food lovers will rejoice over this new state fair food. It's a southern take on a fried egg roll and it delivers big time in flavor. Everyone I talked to loved this dish. 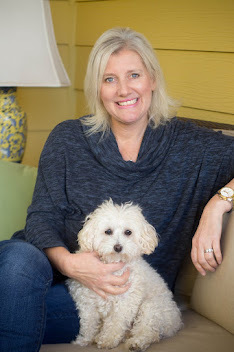 I did, too. In this eggroll, you fill N.C. farm-raised shrimp, N.C. ground cheese grits and tasso ham. It's then topped with a red pepper remoulade sauce. 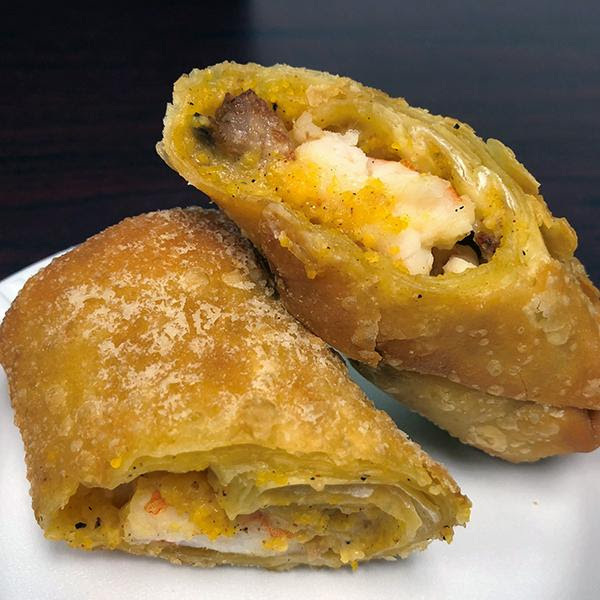 The inside of the eggroll is soft and not crunchy like a traditional eggroll so it surprises you at first bite. You can find this food near the Grandstand ticket area. It's pretty and it tastes good, too. What more information do you need? This is sweet a dish that you may want to share with a few people. 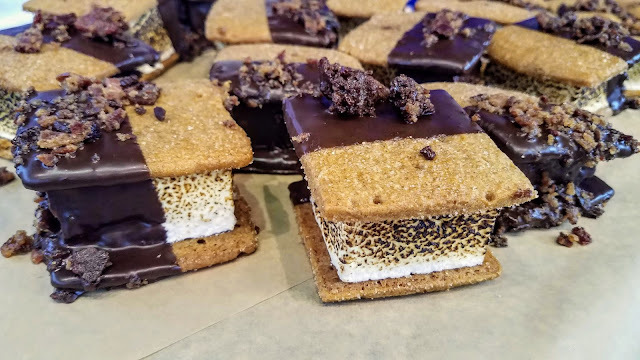 My favorite part was the homemade marshmallow filled with applewood smoked bacon ganache. 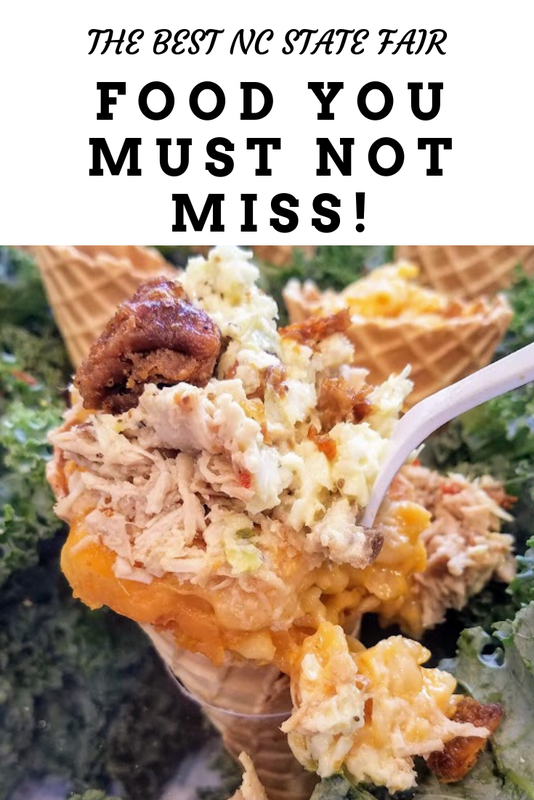 It's one of those dishes that you take a bite and say, "Oh, that's good!" Then you take another one and another one and it's half gone. With this dessert, it also depends on what side you start nibbling. The chocolate bacon ganache dipped side is definitely richer and I personally ate more of the non-dipped side. But overall, I loved the flavors. It will be much bigger than what I tasted so I think it's definitely one to share. You will find LaFarm Bakery near the North Carolina Pottery Exhibit. 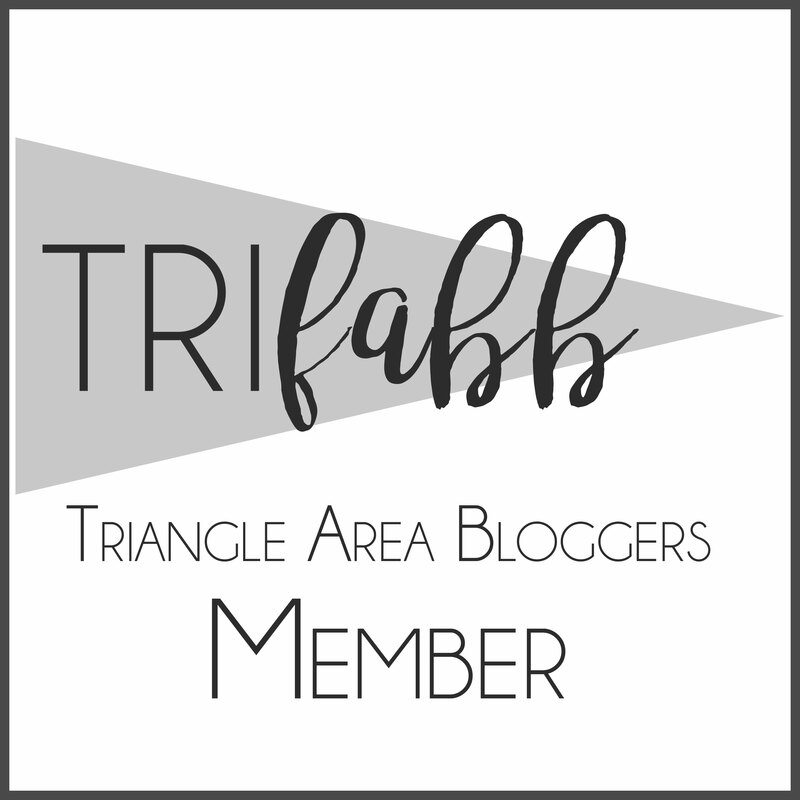 LaFarm is a Cary, North Carolina bakery that I've featured many times on this blog. There are 22 new foods at the N.C State Fair this year plus a Public House with NC Wine and Beer. 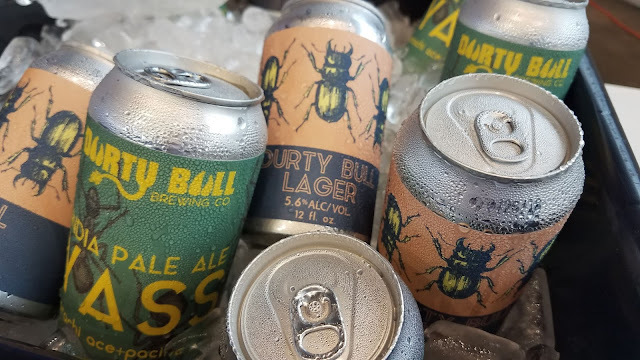 Durty Bull Brewing Company in Durham will be one of than thirty vendors on tap. I loved their samples and am a fan of its Oak-Aged Blonde Sour. Tickets to the Our State Public House is $10 and that price allows two sample servings. Beer and cider samples are in 8 ounce pours. Wine is in 3 ounce pours. 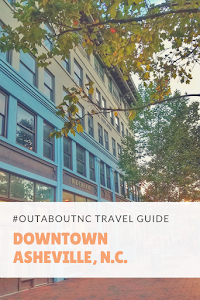 You can learn more about the rides, exhibits, and attractions at the NC State Fair, where to park when visiting the fair, where to get a shuttle in Raleigh where you can park and ride to the NC State Fair, ticket prices, and lodging options near the NC State Fairgrounds by visiting the N.C. State Fair website. An important date to remember for the NC State Fair is Thursday, October 18 is Food Lion's Hunger Relief Day. Bring in five cans of food and get one free fair admission ticket per person.